Happy Holidays everyone! 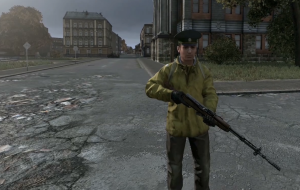 As some of you may know, DayZ just recently celebrated its first year in Steam’s Early Access program. The Early Access experience has been both challenging and rewarding for everyone on the development team. With that in mind, we have put together a high level document looking at what we have accomplished together in 2014. Pairing that with our goals ahead for 2015, we all have a lot to look forward to. With 0.52 hitting stable branch today, the holidays should see some interesting gameplay. I for one look forward to the expanded options for the roleplaying communities, as well as the outstanding changes to player versus player engagements I plan to have on first person only servers (when rescuing innocents from bandits, of course!). Suppressor support, hotfixes to address the majority of the gunshot audio issues, new animations, the first iteration of the chainsaw, and of course who could forget the seasonal festivities. I hope to see you all around the Christmas tree in Novod. I’ll be looking for the bear that has my name on it. I have been having an epic good time playing DayZ with friends ( Season 1 - Season 2 - Season 3 ). I look forward to the push towards Beta and the additions that are planned.